The product is for sale in vacuum packed, it’a a long-life product and it must be refrigerated. Once opened, it should be wrapped in a towel to preserve the organoleptic properties. Serve it at room temperature, taste and feel it slowly. This cheese is ideal as a product of meditatoin. You can feel its magic taste of wild berries let it melting in your mouth. These cheeses are ideal for many creative culinary ideas, mostly for appetizers, cappelletti, ravioli and passatelli. They’re also fantastic in thin slivers of cheese with roasted meat. Excellent for special dessert with Acacia honey, caramelized figs or Savor di Romagna. 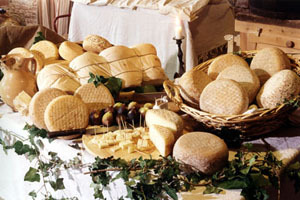 Many local wines like Sangiovese Superiore are perfectly suited to cheese. In recents times we have developed a new fantastic combination in collaboration with Brezza di Mare Restaurant: it’s called “I mondi di sotto”. It combines some kind of cheese with fabulous fish sausages. This idea has captured the taste of the best national and international experts.